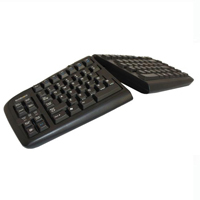 The Goldtouch Adjustable Keyboards are divided into two separate halves connected by a plastic sphere located in the centre rear of the keyboard. This sphere acts as the pivot on which the keyboard can be splayed or vertically adjusted. The Goldtouch adjustable keyboards are not as wide as standard keyboards, which are usually ~18". The numeric keypad has been removed from the right side of the keyboard and is embedded within the right half of the keyboard. Adjustment is accomplished by releasing a lever (located on the back edge of the keyboard), moving the keyboard halves, then pushing the lever back in place to lock the position. IMPORTANT TECHNICAL NOTE: Do not attempt to plug a Goldtouch V2 Adjustable keyboard into one of the USB ports located on the sides of the USB keypad, as these ports are intended only for low power devices, like mice or USB storage drives. Doing so will cause the keyboard and keypad to malfunction. Click here for more images and sample configurations. This ergonomic adjustable keyboard offers a continuously adjustable splay or split from 0° to 30° and continuously adjustable tent from 0° to 30°. This product is available in Black or White and comes in USB with a PS/2 adapter. There is also a French Canadian bilingual legended layout. IMPORTANT TECHNICAL NOTE: Do not attempt to plug a Goldtouch keyboard into one of the USB ports located on the sides of the USB keypad, as these ports are intended only for low power devices, like mice or USB storage drives. Doing so will cause the keyboard and keypad to malfunction.